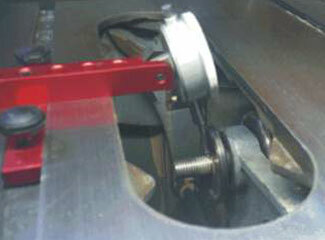 Download the Table Saw Test 1: Checking Arbor Run-Out & Bearing Play Manual. For your saw to operate properly, the “business end” of the saw must be in good mechanical condition. This means that the arbor shaft should be straight, and the arbor shaft bearings must be in good condition. One thing that should be emphasized is that this is a very preliminary test, and can be done with either of the A-LINE-IT kits. I also want to emphasize that if your readings aren’t perfect on this test, don’t panic and set your saw out near the street with a “For Sale” sign on it… we have more detailed tests that will explain how we can determine what is happening near the saw blade teeth due to the condition of the arbor. Thoroughly clean the arbor shaft to insure there are no burrs or contamination that can cause improper readings as you make the following tests. The following procedure will allow you to determine the straightness of the arbor shaft. The reading is taken on the smooth surface (behind the threads) where the bore of the saw blade is positioned. Step 1. With the A-LINE-IT positioned on the guide slot as shown in the photo above, the dial indicator should be pivoted (and locked) in a position that places the tip of the indicator over the smooth area on the arbor that is between the threads for the blade nut and the arbor flange. Step 2. Elevate the arbor shaft to make the pointer on the dial indicator to move at least 1 revolution (clockwise). Step 4. Either clamp (or hold) the A-LINE-IT at this position, and “zero” the pointer on the indicator by either rotating the face of the dial or changing the elevation on the arbor. Step 5. Slowly rotate the arbor by turning the belt(s) on the saw. You will see any run-out in the arbor shaft. If you see more than .001” – .002” (one to two thousandths of an inch), there is either some dirt or contamination on the shaft, or you may need to do more detailed tests (Table Saw Test 2) to determine if there is a problem with the arbor shaft. I’d recommend you re-inspect the shaft to make sure there is no contamination, and re-test the arbor. The following procedure will allow you to determine the condition of the arbor bearings. The reading is taken on the smooth surface (behind the threads) on the arbor shaft where the saw blade is positioned. Step 1. Position and secure the A-LINE-IT as explained in Step 1 through Step 4 above. Step 2. Hold the threads of your arbor, and lightly try to move it (back-and-forth and up-and-down) while watching the pointer on the dial indicator. You should see no movement of the pointer (but you more than likely will, because we normally apply more pressure than necessary). NOTE: Table Saw Test 2 will illustrate how you can determine the condition of the arbor, and show the effect it has at the teeth of the blade.